1. THE NUMBERS – Ten Venues. Two years. Over a quarter of a million visitors. 2. 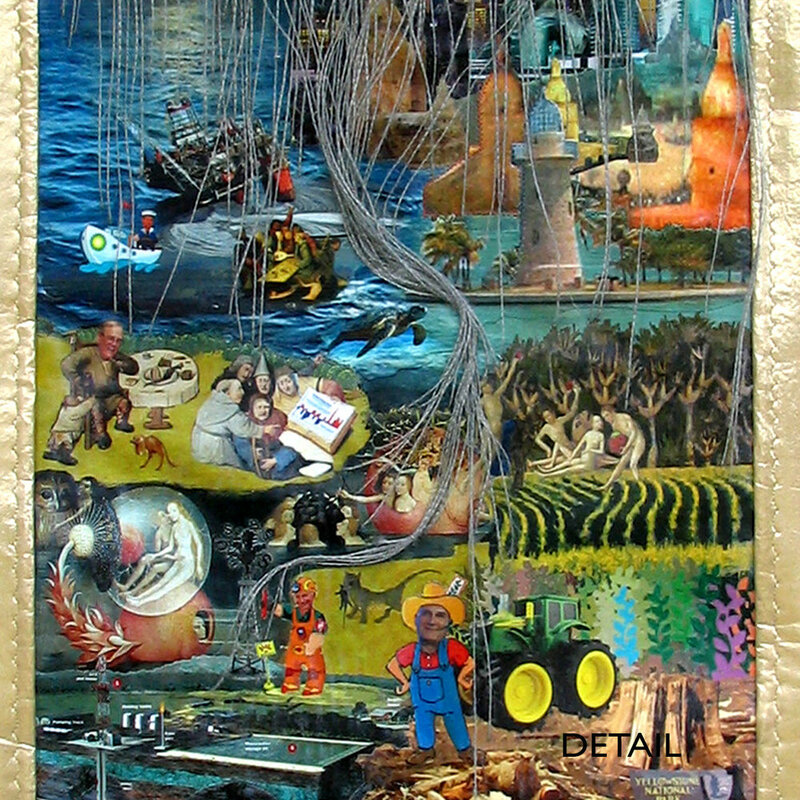 THE ARTISTS – This is a project of FLORIDA textile artists, promoting our artwork and our environmental concern, across the nation. 3. THE HOST - The exhibit, “Piecing Together a Changing Planet” has been co-sponsored by the National Parks Service. Their employees have assisted with hanging, promoting, and planning educational presentations around the exhibit. 4. THE NARROW ESCAPE – The exhibit was in Gatlinburg in November displayed at the Arrowmont School of Art and Craft when wildfires ripped through the area. After several days of no communication, the e-mail was received: "The quilts are 100% OK! It's a miracle, truly." 5. THE TRUTH: The website of the National Parks Service continues to educate citizens about global warming. From the site: “The global climate is changing, and manifestations of that change are abundant in some of America’s most treasured places, her national parks. The diversity of impacts is as varied as the parks themselves. Rising sea level threatens Cape Cod, Assateague and Point Reyes. Ice is nearly non-existent at Glacier. Flowers bloom earlier in the Great Smoky Mountains and fall colors arrive later along the Cuyahoga and Schuylkill Rivers. Corals bleach at Biscayne and intense storms rip up docks at the Statue of Liberty. At Lowell smoke stacks harken back to the very beginning of the industrial revolution. Elsewhere, migrations are disrupted, fires rage, animals. “Piecing Together a Changing Planet” will end its tour with an exhibit through June 30, 2017 at Olympic National Park, Sequim Civic Center in Sequim, Washington. My artwork, co-created with artist John Lewis, is “End of Eden.” We used the image of diminishing water supply and the satirical images of Hieronymous Bosch’s 15th Century altarpiece to build our statement in textiles. Art has the power to change hearts and open minds. Somewhere in these travels and interactions with visitors I hope that has occurred. See “End of Eden” here. Visit the exhibit web site here.